If it weren’t for lists like the 52 with a view, I’d just hike Franconia Notch over and over again. It can be hard to justify driving 4 hours for little 3600’ mountains when 5000 footers are only 2 hours from home. But it’s hikes like Mt. Success that remind me these harder-to-access mountains have their own joys too. Challenging trail conditions, perfect weather, dramatic skies, good company in lucy, J, and dr_sunflare: this is why we get outside. Mt. 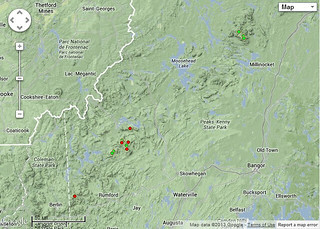 Success is located east of Berlin (NH) right on the border of Maine. It’s 5 miles back on an idiosyncratically-maintained logging road, so you’ll need 4 wheel drive to access it in winter. We had to park a bit down the road from the unplowed trailhead road access, adding another mile or so to the round trip distance. We started on a gentle, broken slope with temperatures in the high-30s and quickly stripped to our base layers as we warmed up. The trail gradually became steeper, eventually reaching a rocky overlook about halfway up that provided a preview of Success itself and the surrounding foothills. Above the overlook, we hit the thermocline layer above the freeze-thaw cycle so the snow became fluffier and much deeper. Though the going became tougher, we were treated to an enchanted forest of glazed trees. 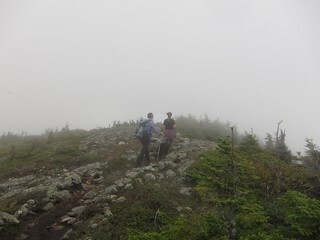 By the time we hit the Appalachian Trail on the ridge line, the conditions got serious. In a replay of my Maine through-hike, the snow eventually reached above the 8’ tree clearance-height, so we lost our trail blazes and had to fight through branches that would ordinarily be over our head. There were a few missteps, but we mostly managed to keep ourselves on-trail. On the steeper parts, it could be difficult to get purchase in the waist-high powdery snow; two steps forward/one step back was common. 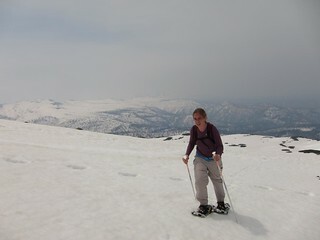 One feature in particular was so steep that we had to remove snowshoes and just slide down. (Climbing back up it was even dicier.) With temperatures dropping, we suited up with all of our layers and hit the summit about an hour behind schedule. The summit is a broad, flat ledge with wind-blasted ice and exposed rocks. The open alpine garden affords excellent views north to Old Speck (ME4k), east into the Mahoosucs, South to the imposing cone of Mt. 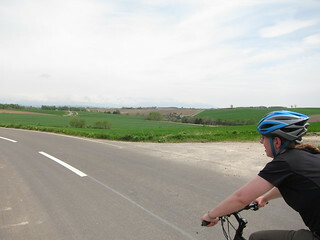 Washington, and west to the foothills of Berlin. High cirrus clouds had rolled in since the overlook, creating some spectacular wispy effects before the weak sun. Rime ice coated every vertical surface. Layered ice crunched underfoot. We were insulated enough that we had some time to take photos and enjoy the scenery, but saved our lunch break for a point below treeline. After an uneventful descent, we arrived back at the cars just in time for a bright orange, pink, and red sunset over the foothills. Winter conditions made this hill more challenging than it needed to be, but that just made the post-hike pizza even more delicious. Success Pond Road was plowed, but slushy in places. 4WD recommended. Snowshoes required. Did not use microspikes. Best telling: TW's story about his grandmother and a cow, supporting his chicken dumpling soup. Strong showings from 5 first-time Swappers, including salt cod stew, ham & bean soup, and onion soup. 2013 was an unusually strong year for returning artists from the late 90s and early 2000s. Much of what we got was reminiscent of what we have heard before, but made up for lack of new directions with a basic ability to deliver on established strengths. Want to listen? Check out the spotify playlist. Radiohead's Thom Yorke continues to produce twitchy, compelling solo content with this year's "Atoms For Peace"
Goldfrapp released her best album since Felt Mountain with "Tales of Us"
Even Depeche Mode continues to put out music as strong as their glory days in "Delta Machine"
Eluvium successfully added vocals to his dreamy style in "Nightmare Ending"
Kronos Quartet teamed up with The National's bassist to produce an incredible contemporary chamber piece "Aheym"
I usually can't stand rap for its self-aggrandizing consumerism, but Kanye West's "I am a God" is so completely bonkers in the extreme of its self-aggrandizing consumerism that it's irresistible. Now bring me my damn croissants. Franz Ferdinand's "Right Action" is the only good song from their new album, but it was the perfect upbeat sountrack to the summer. I wanted to like Neko Case's new album, but only "Wild Creatures" captured that smoky nighttime roadside feel I love so much. 2013's total was an increase from 2012's 118.2 miles and a near-tie with 2011's record 180 miles/2010's 178. 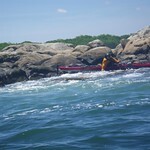 Block Island carries over from last year's dream paddle list. For next year, I'm adding the insane 90-mile traverse of the Bay of Fundy to celebrate the return of the international ferry. Bring it on! 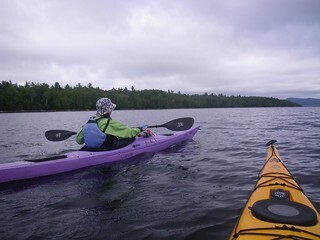 Some paddles, you slide over glassy sheets of water with time to chat, drink, snack, take photos, and relax. 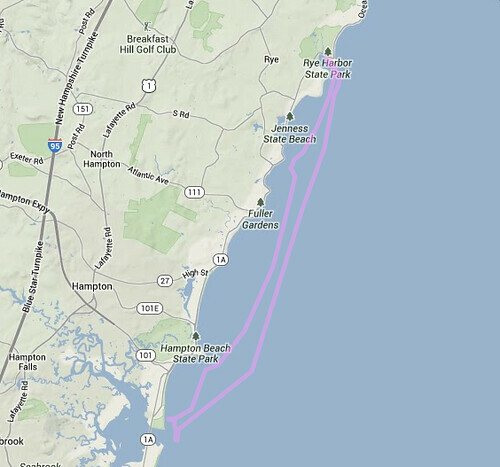 The interisland traverse from Martha's Vineyard to Nantucket is not like that. The subsea topology is a constantly-changing mixture of channels, shelves, and sandbars. 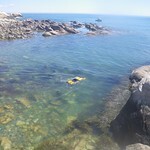 Currents can move in 3 directions, sometimes intersecting in a single spot. When it's bad, it's a den of serpents that want to grab the sides of your boat and pull you under. 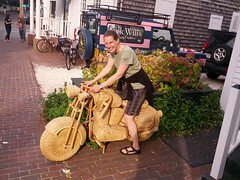 When it's good, it's a hammer to your stern that picks you up and hurls you at your destination. These conditions require constant attention to balance, stroke, and orientation. Just taking a drink or checking a map demanded rafting two boats together for stability. 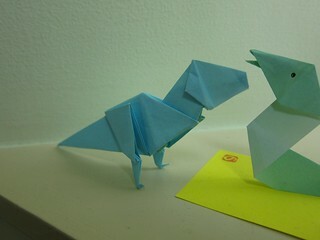 We didn't talk much. 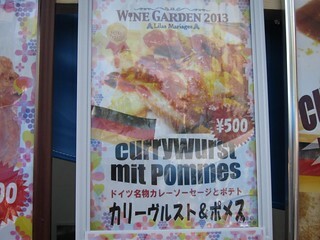 We drank furtively and quickly from tubes. 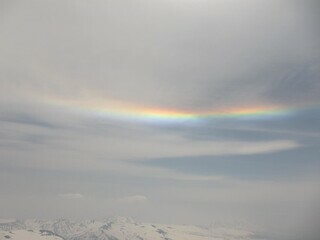 We took few photos. And it was glorious. 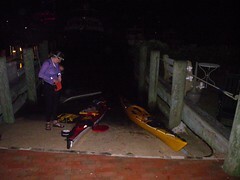 Day 2 began an hour before sunrise as we geared up and slid our boats from the dock exactly at the 5:45am slack tide. 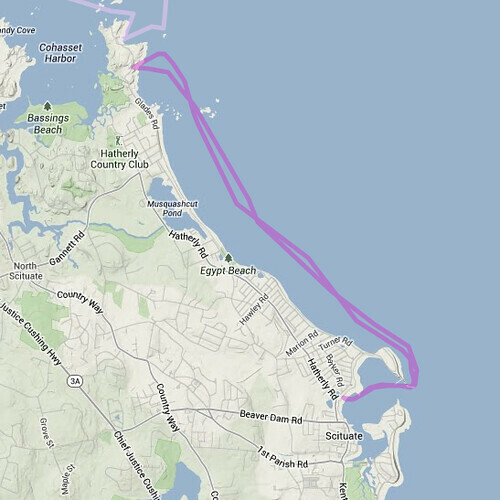 The interisland currents run west-east, so you get a boost but only as long as the flood tide is on. 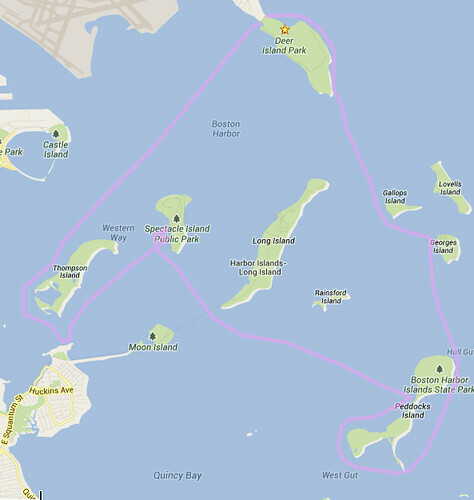 Starting with slack gave us exactly 8 hours until the other slack point in Nantucket harbor at 2pm. 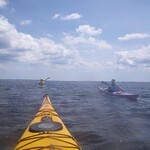 Go slowly or have a problem, and you're working against the current at the end of the trip when you're most tired. 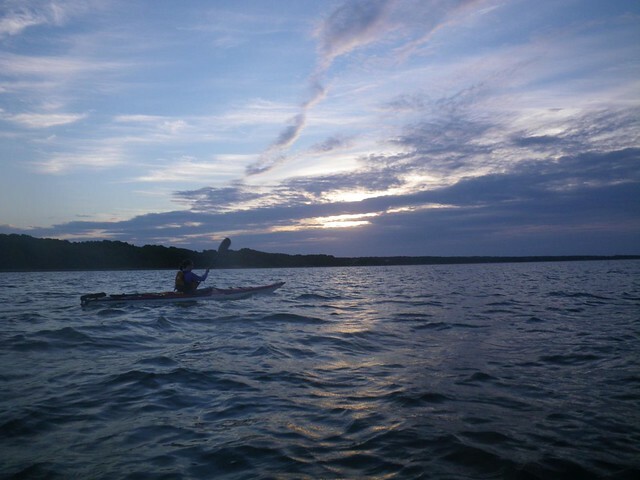 Well-motivated, we headed south through Katama bay with the sun rising behind dark but dissipating clouds. 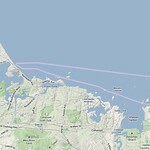 We got hung up a few times on shallow spots, but quickly reached the narrow "cut" that separates mainland Martha's Vineyard from Chappaquiddick. This dangerous water is where wind-fetched ocean breakers meet bay currents, so we pointed our bows straight into eye-high waves and got out into deep water as fast as possible. After that, we rode current and wind directly into the sun as the GPS instructed us to. It wasn't long before we completed the 8 mi open-water crossing to arrive at Muskeget, with its large and curious pod of seals keeping a watchful eye on us. 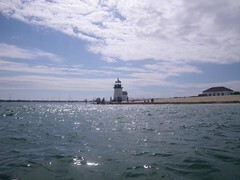 From there, we passed north of Tuckernuck island and eventually routed around the breakwater into Nantucket harbor. The shipping channel is dredged very close to shore, so we had a close call with an incoming ferry but nobody got run over and we landed safely. 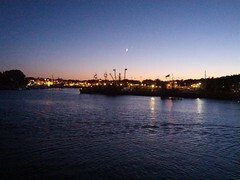 After a lunch and a little bit of exploring, we loaded the boats onto the car ferry back to Hyannis and drove home with shoulders less aching than expected. In 1949, the State of Maine seized the farms and homes of about 200 people to create an artificial lake for a private company to generate electrical power. The town of Flagstaff became Flagstaff Lake, and the locals haven't forgotten. I traveled up to the Carrabassett Valley to paddle over the historic sites and also bag a few more 4k peaks, making for a great week. Mt. Redington only recently became a 4k peak after a wind farm resurvey added 12 feet to its height. There is no official trail to the top, but a composite of sketchy internet resources enables the intrepid hiker to follow logging roads and herd paths to the top. With a low cloud deck, we saw no views but enjoyed the mysterious dancing fog among the pines. It was a long but flat hike, and the ample raspberries and blueberries provided adequate compensation for the lack of vistas. ME4k #9/14. Sugarloaf sits next to Redington at the end of Carrabasset Valley Road, so we camped on the AT next to the river and hiked up to bag the highest peak in the valley. I missed Sugarloaf on my March thru-hike due to some difficulty in wayfinding, so it was satisfying to check this one off. The first two miles are a steep rise with fine views down the valley, followed by a closed mile of spur trail. The top is less impressive since the summit is littered with ski lifts, a ghost lodge, and radio antennas. Our feeling of accomplishment was also diminished by the antenna workers at the top who had ridden ATVs up to do some maintenance. At least we had a bored cop available to take our photo. ME4k #10/14. 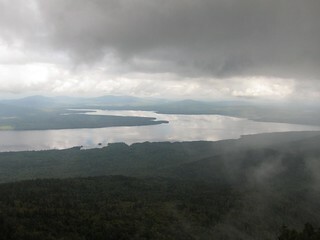 The Bigelow Range is supposed to be the gem of the valley, with a broken ridge along the south side of Flagstaff Lake. 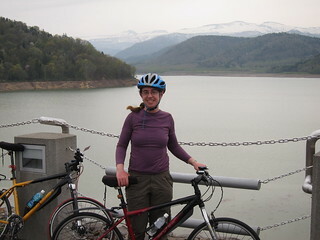 Peakbagger and birthday-girl yuper joined us for her first ME4k climb up from the lake. Unfortunately, rampant clouds obscured any omnidirectional panoramas but the cover was sufficiently intermittent that some patience would allow views down into the valley or the lake. 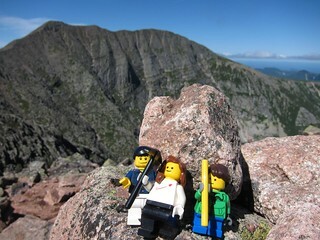 Also, the hike up the ridge offered multiple lookouts of Little Bigelow below the cloud deck. 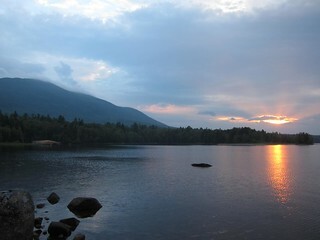 Avery Peak is named after the guy who shepherded the creation of the AT. It's cool that the peak bearing his name is at the 2000 mile mark from Georgia. 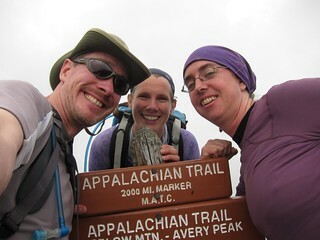 This is thru-hiker season and we met (and smelled) our fair share as they tromped through. ME4k #11 and #12/14. I had hoped that our 16-mile kayak trip from the west to east end of Flagstaff Lake would enable some views of the still-extant structures in the drowned town of Flagstaff. 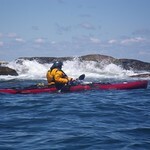 Unfortunately, an unusual weather pattern kicked up and we spent most of the day kayaking into 10kt headwinds and rain. Not the most pleasant of conditions, and much to choppy to enable views deep into the lake. 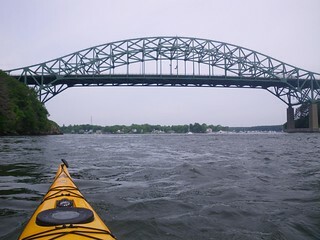 From a historical perspective, our paddle over the Land Below was a bust. 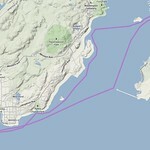 Still, it was cool to travel in a different landscape than my customary coastal ocean route. 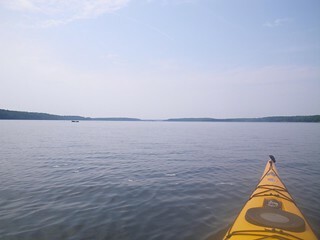 I enjoyed tiny islands, sheltering mountains, warm fresh water, and sightings of bald eagles and loons. 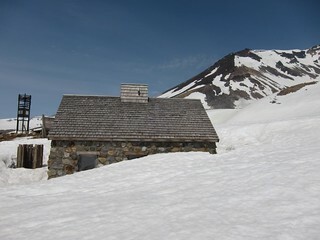 Still, MH&T's Flagstaff Hut was a welcome sight after the strenuous trip. Day 2 of the paddle from the hut to the Round Barn campsite was dryer, shorter, and a little less windy so we could relax a bit more and enjoy the scenery. The dam at the end of Flagstaff Lake feeds into the Dead River, which gets its name because it is usually so calm that it's no problem to paddle upriver. On special big-water release days, though, NexEra lets a few thousand CFS of water through the gates and the Dead turns into a decidedly less-calm trip. 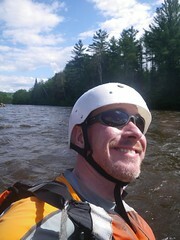 I joined a few hundred other rafters and kayakers for a sustained 14-mile rapid jubilee. Unfortunately, the river never develops the really hairy big water problems that I love but it was fun to have sustained class II/III water with no boring bits. I don't think I'll raft the Dead again (not challenging enough), but I'm glad I tried it once. In addition to the aforementioned spot between Redington and Sugarloaf, we also located a perfect campsite at Round Barn. Yuper and Sasha joined us on a little peak jutting out into Flagstaff, affording views of the Bigelows and catching both sunrise and sunset. Beautiful, if somewhat buggy. This is my third extended trip to the Carrabassett Valley - see also hut-to-hut skiing and AT thru-hike. This beautiful patch of the world is just close enough that it makes for a great last-minute low-overhead vacation and just far enough away that it deserves more time than a single weekend trip. 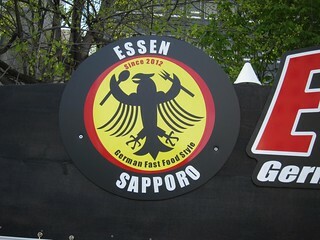 It still have one more ME4k peak to bag here, so count on me to return again. A swarm of factors conspired to keep me off this mountain for years, despite the fact that it's long been at the top of my active highpoint lists. 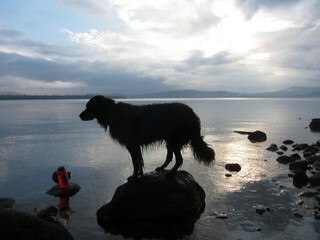 Baxter State Park doesn't allow dogs, so I could never hike it with Kaya. Management strictly limits the number of hikers on the mountain, and the first time I tried to climb it I got diverted over to North Brother. It's a solid 6-7 hour drive. Exposed rocks become unsafe in even mildly unfavorable weather conditions. Et cetera. Et cetera. After this weekend, I'm glad that all those other attempts got diverted because this successful attempt was almost the perfect hike. It was also an appropriate college graduation present for my outdoorsy cousin and special hiking guest star L.
Day 1 didn't even have a big hike. We drove in the car for most of the day, clearing the front gate with an hour to spare before it closed. 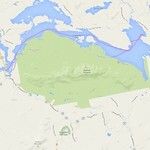 After reaching our trailhead, we hiked up the 3.3 miles to the rustic Chimney Pond campground. This was a pretty flat hike, but with our heavy overnight packs we noticed the portions that were slightly steeper than others. Every once in a while we were treated to views of Katahdin through breaks in the trees, which whetted our appetite for the full mountain. A new weather front wasn't quite finished rolling, forcing us to endure hazy skies with a damp, insect-bitten heat. Eventually, we reached our bunkhouse at the campground with its perfect view of the South Basin. Surrounded on 3 sides by a slabby headwall, our little campground felt insignificant before the mass of granite above us. We pumped water, cooked dinner, appreciated the sunset alpenglow, played Pit, and settled in for a fitful sleep before the big day. Day 2 began perfect, and stayed that way all day. The new front rolled in overnight and welcomed us with blessedly crisp 50-degree morning temperatures. 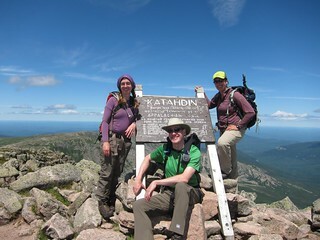 We stripped our heavy camp packs down to their day-hiking essentials and set out for our ambitious "Grand Circle" tour of Katahdin's South Basin. 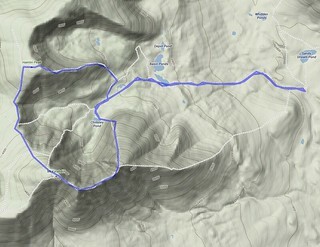 The hike began with the steep Dudley Trail up to Pamola Peak on the south end of the C-shaped basin. Climbing about 2000 feet in a mile, this trail is essentially a boulder slide requiring semi-technical rock scrambling the entire way. 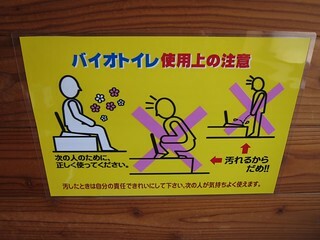 Foul language was used. 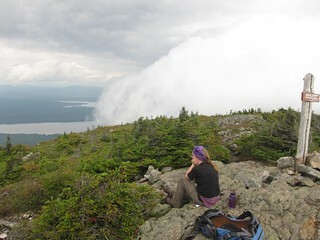 The top of Pamola finally gave us views into the Hundred Mile Wilderness to Baxter's west, as well as a good preview of the wicked Knife Edge trail that would lift us to Baxter Peak. The Knife Edge from Pamola to Baxter is played up as a mere 32" wide rock-hop with thousand-foot sheer drops on either side. It's not actually that bad - most of the trail is actually wider and there are plenty of ledges where you could catch yourself if you fell. 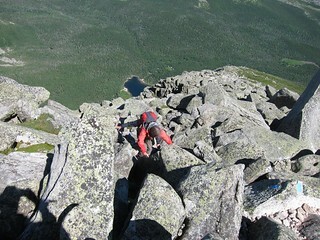 The scariest part of the cross-peak traverse is actually the Chimneys, two broken 40+ foot sheers climb that actually do have some plummet potential. The Edge itself is merely a long clamber over serrated granite with incredible views on both sides of the ridge. 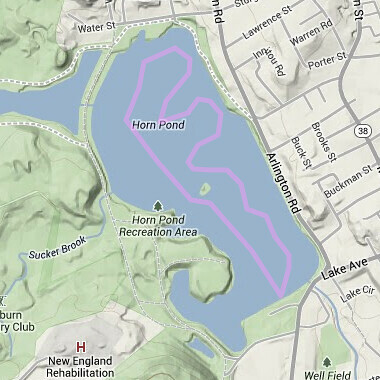 I wouldn't want to hike it in high winds and/or ice, though. 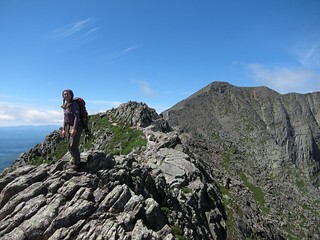 Most people hike Katahdin from the Abol Trail (west) or the Cathedral/Saddle Trails (east), so they don't even tend to reach South Baxter Peak. As a result, it's a pretty chill place without many people. 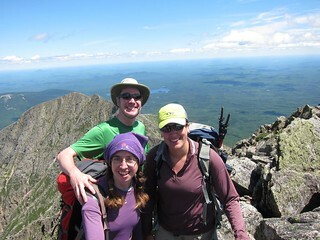 We designated it our main lunch and photo spot, enjoying the unbroken majesty of the view out over the south basin. That said, when you get to Baxter Peak proper, it's worth dealing with all the other people to stop and take a photo with the official "Northern Terminus of the A.T. 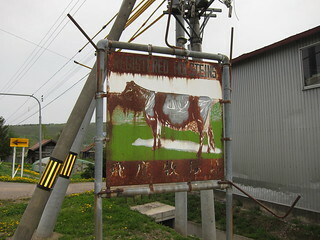 Sign." 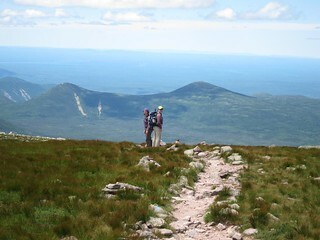 Once you've bagged Katahdin the hard way, the northern trail off the summit leads to the relatively gentle, grassy slopes of the Tablelands. At this point, we were hiking the outside slope of an ancient domed volcano, rather than the caldera that got blown to pieces when it last exploded. 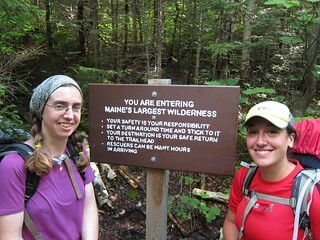 dr_sunflare and L almost cried for joy when they saw how manageable the trail is. 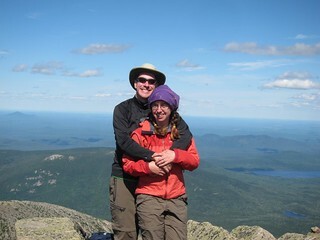 We bypassed the Cathedral and Saddle trails that would have taken us back to Chimney Pond, opting to push on for one more peak on the south edge of the basin. 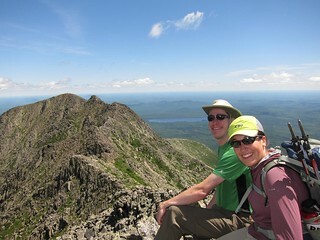 Hamlin Peak is the hidden gem of Baxter State Park. 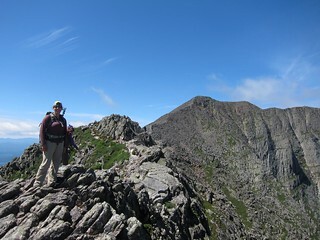 Katahdin gets all the notice because of its height and the intimidating Knife Edge trail. 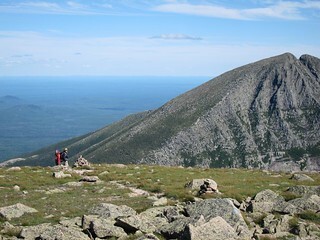 Hamlin is special because it sits between two bowls and features a treeless ridge walk that enables a simultaneous view into both for most of its length. I hear it's an incredible place to catch the sunset. Since we left the saddle, we saw nobody and were able to eat and rest with Hamlin entirely to ourselves. Then came the task of picking our way down the ridge and eventually entering the basin forest to return to camp. 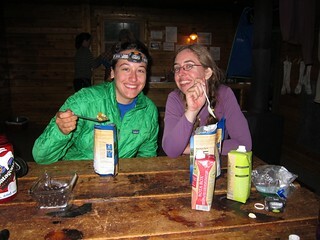 Back at the bunkhouse, we cooked ourselves a huge dinner and immediately fell to sleep. Hard. Waking to another cool morning, we geared up our now-lighter packs (no food!) and walked with protesting knees down the 3.3 miles back to the car. We celebrated with second breakfast at a hiker's cafe in Millinocket that features signatures and graffiti from a decade of through-hikers. More driving, and we reached home secure in a sense of accomplishment and wonder. 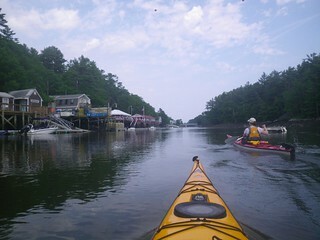 It's a bit of a cheat to say that we paddled 30 miles. Sure, that's what the GPS says. 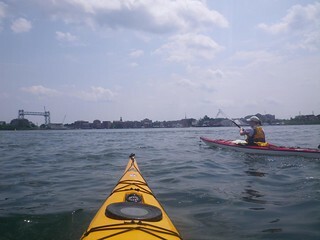 But we put in from Ordiorne Point and paddled up the Piscataqua River at max current, then turned around and rode the same current right back out. 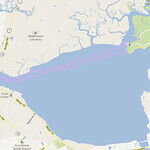 It's pretty easy to cover that kind of distance when you have the tides doubling your speed. 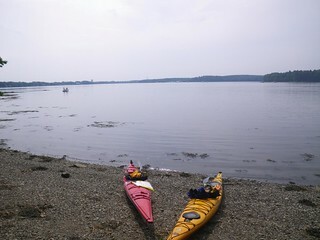 Along the way, yuper and I rode some crazy intertidal chop, checked out the town of Portsmouth from the water, stopped on Goat Island, paddled under some industrial sites on the water, reached the Great Bay, saw a German flag lobster buoy, checked out an abandoned naval prison, and finally achieved our dream of paddle-up lobster at my favorite pound. 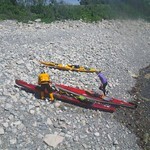 Aside from the technical chop, the only annoyance was dealing with low tide. We had to pick around exposed lobster pots and stick to dredged channels, ultimately taking out from an exposed muddy beach. It's probably the easiest 30 miles I'll ever do. Need to come back sometime and get a closer look at Whaleback light. 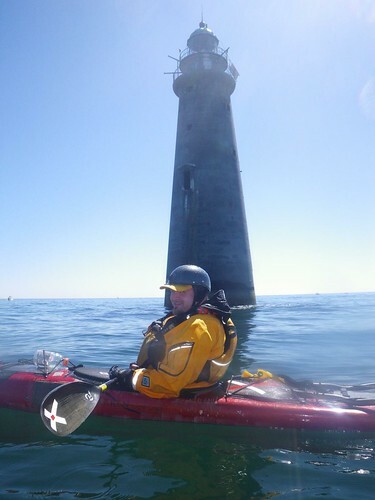 The first paddle of the kayaking season linked Nantasket Beach with Minot Light. 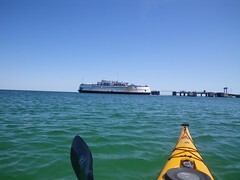 I was joined by archee and yuper on a beautiful summer day with light breezes and views all the way to Salem on the North Shore. 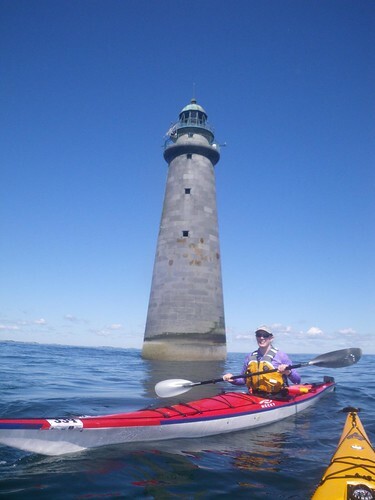 Minot light is built on a rocky shelf that never quite pokes above the sea, even at high tide. This has the effect of (1) making it look like the lighthouse just rises randomly out of the sea and (2) creating surprise rogue waves when the ocean currents hit the ledge. We surfed the risers a bit, but mostly just enjoyed the beautiful day. This was my second trip to Minot. The first time was foggy and atmospheric, so I appreciated the sun and long views. 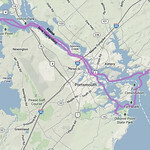 That trip approached from the south, whereas this one came in from the northwest on a route I have never paddled before. 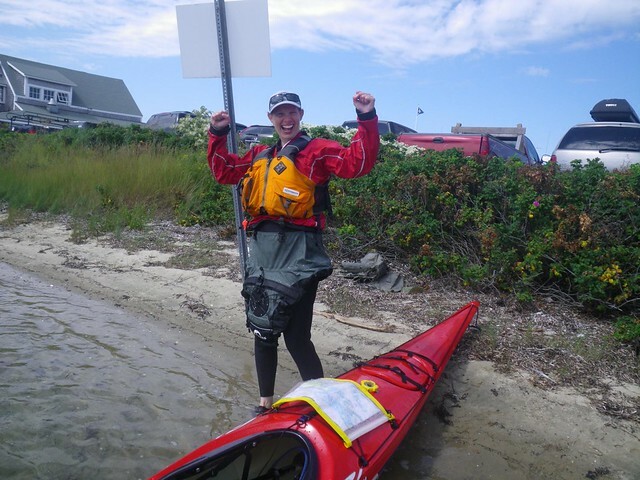 The project to section-paddle all of Massachusetts continues apace. 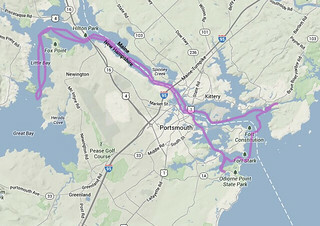 Total trip distance: 12.9 miles. The sea is warm enough that my insulating layer was annoying while dry and insufficient when wet - can't wait for the water to warm up a bit. 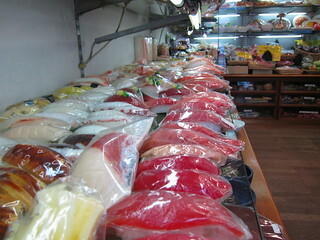 Wakanai in the far north serves incredible seafood, especially salmon, ikura, and crab. 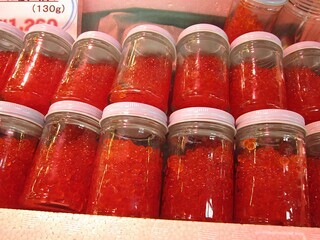 It turns out, though, that one of my favorite things about ikura (salmon roe) is the pop-pop texture that comes from having a thick skin, an attribute missing when it's fresh. Still, it had never occurred to me that you can make a meal out of a big bowl of rice and a heavy heaping of ikura. So simple, and satisfying. 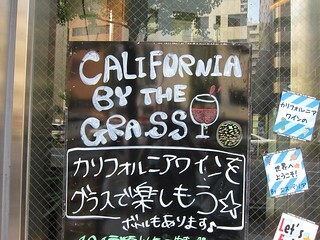 Hokkaido is Japan's dairyland, so there is more cheese and general european influence in the cooking than elsewhere. 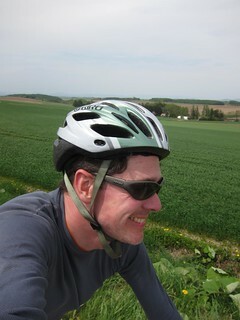 Who would have thought that my cycling lunch would be fondue? Remember William Gibson's Idoru, a story about a synthetic Japanese pop star who draws gigantic crowds? 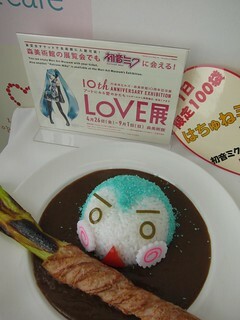 While in Mori tower, I run across a cafe devoted to Hatsune Miku, a blue-haired artificial pop star who sells out arena shows. 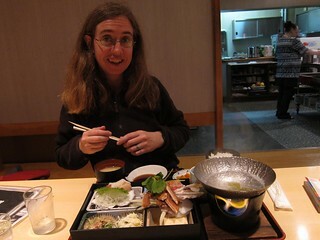 They even serve rice dishes with a very-vague resemblance of her face. Even Gibson never came up with that. it is impossible to buy a prepaid SIM card in Japan, even in Akihabara. People at the mobile stores look at you like you're some kind of criminal if you try. There is more wifi, even free wifi, than last time I was here. While business hotels want you to pay by the day, smaller hostels and ryokan are now bathed in the warm glow of wireless connectivity. JR even lights up some of the bigger train stations with free wifi. With a bit of creativity, the lack of a local SIM card hasn't cause as many problems as I had feared. 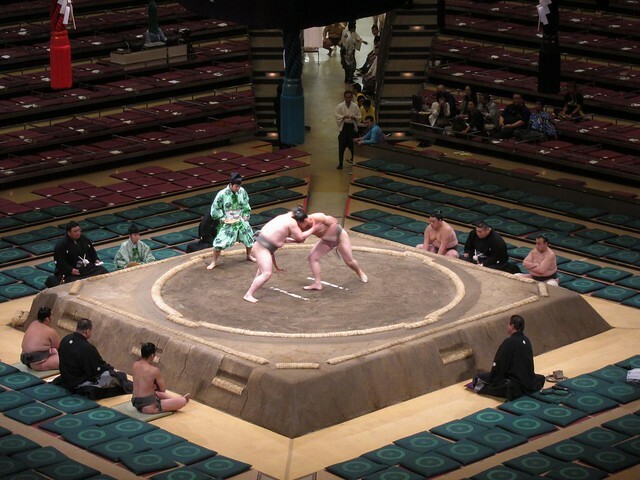 Three of our hotels/ryokans had on-site 24-hour onsens. Soaking in a geothermally-heated outdoor rock bath is a great way to end the day, especially after a hard hike. 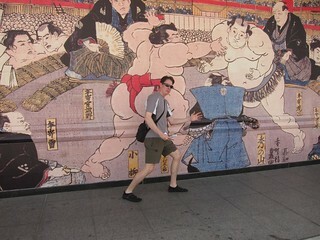 Though tattoos are technically forbidden in onsen, nobody gave me trouble for my ink. we got lucky with rain, only catching some showers on our penultimate morning, which we were spending on the train anyway. 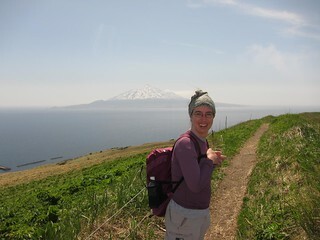 Hike number one: perimeter walk of rebun-to the "flower island". I was kind of looking forward to hiking the neighboring mini-Fuji Rishi but there was too much snow for us to summit without more specialized gear. 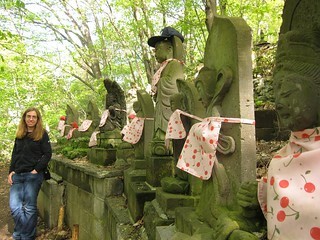 Instead, Rebun offered spectacular views of Rishi and dramatic cliffside trails that skirted sheer valleys. 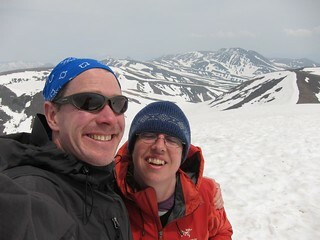 Hike Two: All the way to the top of Asahi, the tallest mountain in Hokkaido. 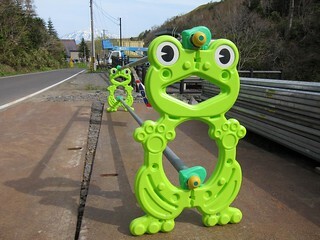 Asahi sits at the western edge of the largest national park in Japan, so the climb up looks out mostly on the valleys, lakes, and farmlands of the foothills. Once you reach the top, though, the view opens up to show the entire volcanic rift canyon of Daisetzusan with dozens of snow-capped peaks. Add in some active volcanic vents and it's unlike anything back in New Hampshire. 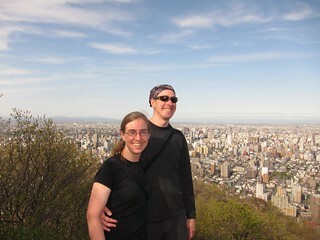 Sapporo also has a few hills ringing the city. Mt. 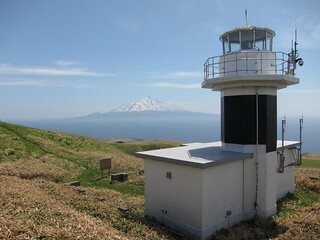 Maruyama is a low-key hike that offers good overviews of the town, all the way to the ocean on a clear day. I could never see myself living somewhere as congested and overwhelming as Tokyo, but Sapporo is very much my kind of town. With close-by mountains, ocean, and sushi it meets all of my requirements for a place to live. Add blooming flowers everywhere, a quality public transport system, and a university and you have a livable city. 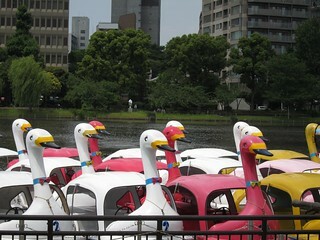 Swan boats of Ueno Park, apropos of nothing. 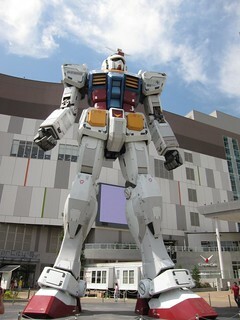 On day 1 in Tokyo, I wandered a few of the more modern districts like Mori with its contemporary art museum and the harbor district with its shopping centers and full-scale gundam battlesuit. 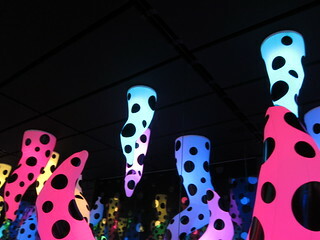 At the time, I felt a queasy lack of "authenticity" - everything seemed fake and plasticy. 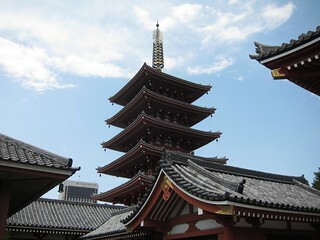 On day 3, I engaged in some more traditional-style wandering through the temples and cemeteries of Ueno park and the shrines of Asakusa. 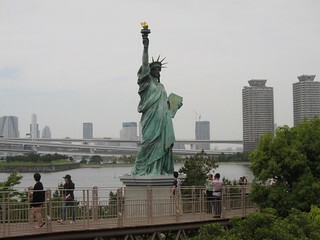 Looking carefully at the construction dates, one notices that all of the "old" stuff was rebuilt in the 60s and 70s when the Japanese economy had recovered enough to reconstruct the sites destroyed during the Allied firebombing campaigns. 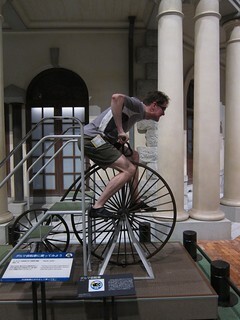 The massive Edo-Tokyo museum similarly resorts to replicas of Meiji-era buildings. The quest for authenticity in Tokyo is a farcical one; the traditional "old" buildings are just a modern reinterpretation of the original structures and the shopping malls packed with teenagers buying licensed-character junk are probably the closest thing that exists to a "real" Tokyo. Fashion note: I brought only my FiveFinger shoes and hiking boots. 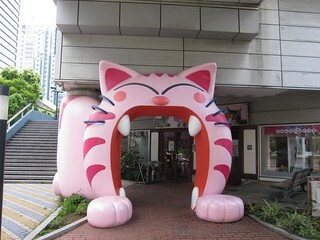 The Japanese were generally intrigued by the VFFs, sometimes staring or exclaiming in surprise. One ryokan hostess moved our shoes into the proper shoe storage place and looked at them for a long time saying "Oh... very Japanese shoes." It's not unusual here to wear toe shoes that separate out the big toe. VFFs are just the natural ad-absurdum extension, I suppose. Also of note: one of the shopping malls had a "cat cafe" where customers pay a premium to sip tea amongst a cloud of allergens. This might be close to my personal definition of Hell.